I made this just now and I thought this should be submitted as part of the Merdeka Open House 2009 organized by Babe in the City- KL too. I think many people often see this but they don't know the name to it. 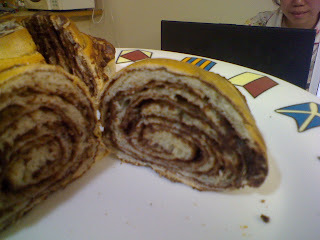 This is a favourite among my family members and it originated again from my Granny. Please people, no show off here. I just thought both Angku Kuih and Kuih Serimuka truly represents Malaysia. At first, I wanted to do Rempah Udang since I could do the colour them of white and blue but Bunga Telang is almost impossible to find here, even dried ones. And I don't think I wanna use blue coloring so I made these little jewels instead. I did use pandan paste here but somehow, to me, pandan paste seems healthier than blue coloring. I guess the color puts me off. I know I'm weird! This time, this one focuses on banana leaves and also pandan leaves. Pandan leaves or screwpine leaves are commonly used to infuse flavours especially into rice. 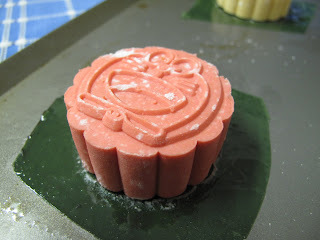 It is used in Nasi Lemak and almost every other Nyonya delicacies. 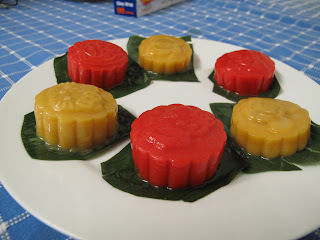 You can blend it with some water and extract juice or just use pandan paste for this one. Pandan leaves are scarce here so I really couldn't afford using 10-20 of these leaves for blending just to make it look green au natural. This recipe makes one 7 inch round tray. It is of perfect height. Remember to oil the base and sides of your baking tray to ease removal. Start off by soaking 200g of glutinous rice overnight. Wash them clean and add 5 tbsp coconut milk, 3 tbsp water, 1/2 tsp salt. Mix them up well and place 2 pandan leaves, knotted on top of the rice. Preheat the steamer until very hot. Steam the glutinous rice over high heat for 15 to 20mins. Discard the pandan leaves and fluff up the glutinous rice. Now, compress the glutinous rice with a sheet of banana leaf and press till very compact and firm. If not, your pandan custard will later on leak into the rice layer. Then, it won't look good. You could also use the back of a glass, wrapped with aluminium foil and compress it. I find both pretty hard but my housemate, Samantha did it for me in no time and she look so effortless doing it! 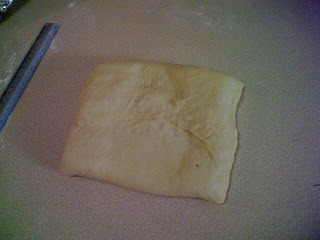 Once done, steam it back on high heat just to get the shape and texture better, high heat, 7 to 10 mins or so. Make the green pandan custard. Whisk 2 large eggs with 6 tbsp coconut milk and 1/2 cup sugar. In another bowl, combine 5 tbsp pandan juice (I use canned ones)with 3 tbsp cornflour/tapioca starch and 1.5 tbsp plain flour. 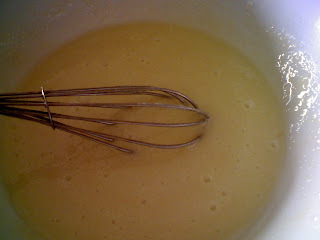 Whisk that until lump free and add into the egg mixture. Whisk to combine. Strain it once into a large bowl. Bain-marie the mixture until it turned custardy. I did mine on high heat, stirring nonstop and it took me just 10mins. Pour the custard over the glutinous rice layer. Pop that back into the steamer and steam on the lowest heat setting (as small as possible!!!) for 15 to 20mins. 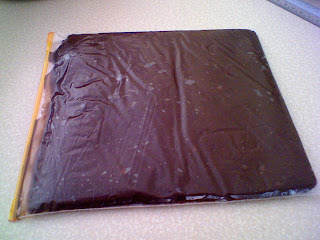 Cool it in pan completely before slicing. A plastic knife works beautifully here. I like these jewels cold so I usually serve them chilled. Adelaide is so cold today that I steam them, remove them from the steamer. It was as chilled as coming out from a fridge in just 30minutes! I hope more people will be exposed to Malaysia treats. They are often troublesome, needs a lot of part and different cooking. Thn you gotta bring them together again and assemble them and so forth. It is worth it when you have a bite into one of these little morsels. I'm sorry I went hiatus for some time again. Uni started and the everyday of 9am till 5pm of listening to lectures are killing me. I am so glad I get to stay busy in the kitchen doing things I love to do now.... I will be submitting this entry as part of the Merdeka Open House 2009 organized by Babe in the City- KL. Malaysia truns 52 years this August 31st. 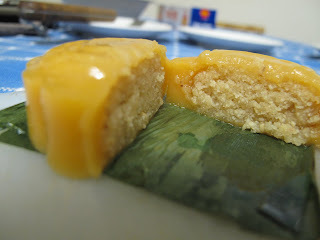 And the theme chosen for this year’s virtual open house is My Sweet Malaysia. I love it that this is a great way to show the world what Malaysia delicacy is all about. So, please do support me in this act and do remember to check out Babe in the City- KL blog on August 31st for the final round up of some truly authentic sweet Malaysian treats! This is a fusion in terms of look. Taste wise, it is definitely as authentic as those you could get by the roadsides. This recipe is a hand-me-down from my Grandma. We, being the Peranakan Descendants have a task to share and spread it out to as many people as possible in order for these delicacies to not extinct. 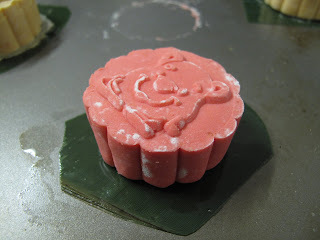 In terms of look, I have opted to use mooncake moulds, with Disney Characters imprints as I'm in Adelaide, getting Angku Mould is almost impossible and I don't want yet another gadget in my pantry that I might not use often. In terms of colour, I have opted to use 2 colours (Red and Yellow) out of the 4 colours (Red, Yellow, White and Blue) from our Jalur Gemilang. 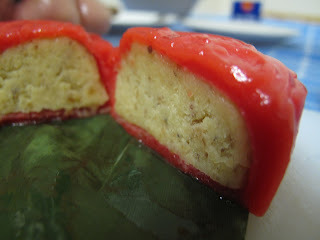 However, I did try sourcing out ingredients and did not substitute anything for this Angku kuih. 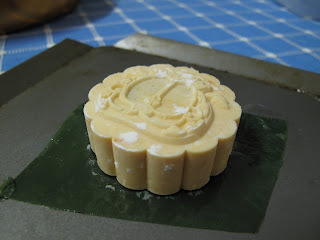 Malaysia sweet treats are usually infused with banana leaves. Banana leaves impart an exotic aroma, which cannot be substituted by almost anything. 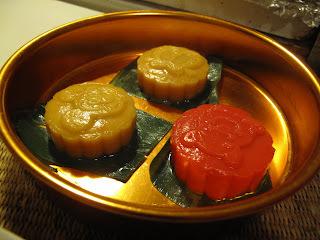 Angku Kuih are usually made up of mung bean fillings. Fried shallots are a must according to Granny. 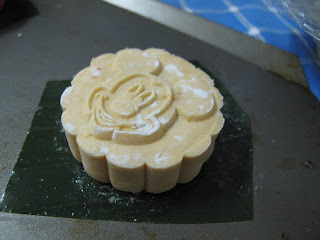 However, over time, things like peanut filling and red bean filling pop up taking places of mung beans. Aaron loves peanut filling and I just can't say no to him. Because, he bought me a Chiffon Pan! I know, I know people, don't be jealous, he is adorable and is so sweet! I have modified the looks of these so badly that if my Grandma sees this, she would be angry that I actually credited her for this! This is not authentic to her. She is a string believer on presentations. Everything must be 'best-quality'. But I know she will forgive me because despite all the scarcity in Adelaide, I manage to still churn out these babies! I hope you do usually make peanut cookies and have some roasted peanuts which are skinned and grounded else just use those readymade roasted peanuts would suffice. Mix the sugar and peanut together and slowly add in enough boiling water to bring them together. Form 3 balls and set aside. Drain the mung bean and steam them on high heat until they are soft. Grandma's rule of thumb, when you hold one grain of mung bean in between your fingers and gently press it a little, it will immediately mash up into fine powdery texture. Then you are done! I use ready made fried shallots. I process that until fine and add everything else into the processor. Blitz them for 10secs or so and they are done. Form 3 balls. If needed, oil your hand accordingly to ease the process. In fact, at this stage, you could use them to make Tau Sar Piah if you like. But you gotta make the flaky oil and water dough first. 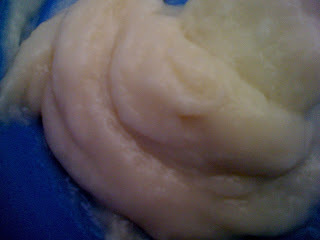 Mash them up and mix it with all other ingredients until you form a soft dough. 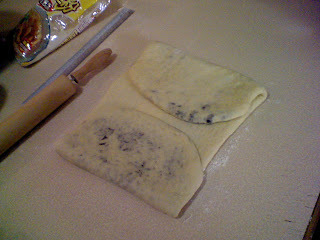 Dough consistency must be such that when you pinch one lump and roll them between your palms, they are wrinkle free and very smooth. Weigh them and form 6 equal size balls, around golf ball size. In fact, at this stage, you could use the skin to make ondeh-ondeh if you want to. 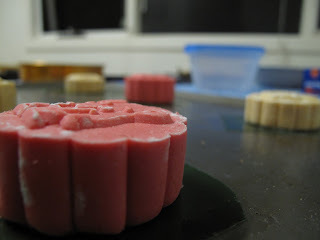 Just form 20g balls each of skin and wrap in with 1 teaspoon of gula melaka. 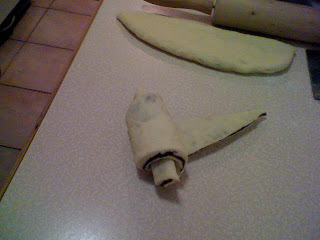 Optional: Tint half the dough with red food colouring. 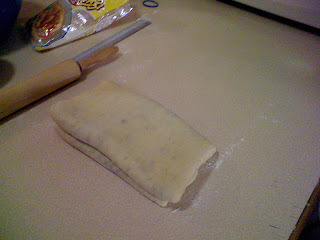 Flatten one ball of the skin and wrap in with the filling. Roll it between your palm until wrinkle free. Place them on a piece of oiled banana skin. Repeat with the rest of the skin and filling. 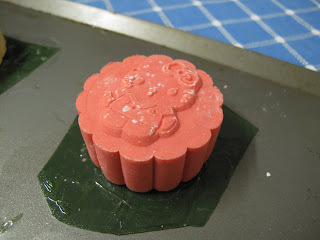 Now, place the moncake mould over the ball and gently press the plunger vertically down and hard to get the imprint and shape on them. 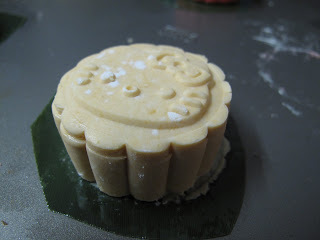 You could use wooden mooncake moulds and angku mould of course! Preheat your steamer and when water reached boling point, steam them over medium high heat for 5 to 6 minutes. Immediately remove them from the steamer and liberally brush them with peanut oil again. Cool to room temperature and serve. We ate them when they are still warm. It was delicious apart from the fact that I probably soaked the mung bean too long (is overnight soaking alright???) and was a little stingy with the oil and sugar. Oil binds it up nicely and sugar brings out the mung bean flavour so just for this time, don't be stingy with these two. After all, you only live once and you'll die anyway when you're old. So, just eat it. It's not bad for your hips if they taste good! Below was what I did when I didn't have banana leaves. Just make sure you oil the baking paper well before steaming. Happy Independence Day Malaysia! 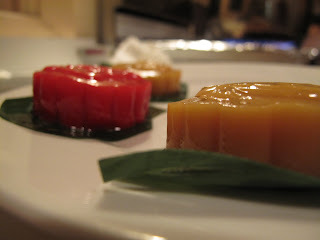 I am truly a Malaysian, check out My Savoury Malaysia on my other cooking blog. Nasi Lemak is a must and there you go again, banana leaves! Thank you Babe in the City- KL for hosting the round-up! Thanks Aaron and Su En for the photographs. In fact, I think they should thank me for giving them a chance to flaunt their skills online, hehe! 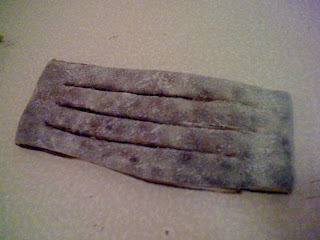 Updated as of 22/10/2009: I've made these with blood orange twice and they are way more awesome. The sweetness is just nice and I love how to yoghurt is lightly tinted pink by the blood orange juice. Very good looking and delicious! This is yummy and refreshing, not too sweet and the yogurt sets to a creamy soft pudding texture. I've bought some really sweet mandarin oranges from the wet market however you can also use ordinary oranges or blood oranges. However, other fruits such as banana, mango or plum would also be great, as long as they are sweet as sweet. This is adapted from Tessa Kiros's book, Apples For Jam. I've practically tried more than half her recipes but of course I'll ony post up what I think is yummy. But one thing's for sure, I've tried all her ice creams, sorbets and semifreddo and they all tasted absolutely wonderful. Maybe cuz I'm an ice cream lover. I think my next post would be sorbet again, I have a strong feeling on that! If you are using plain yoghurt, strain that through a muslin place over a metal siever to drain out the liquid. Mix together the condensed milk, half the orange rind and 1/4 cup of the orange juice in a jug. Slowly mix this into the yoghurt bit by bit. Reserve some for topping and spoon the rest into serving glasses. Cover and chill them in the fridge for a good few hours until it sets to a very soft and creamy pudding. If you are using mandarin oranges, peel them and remove some fibres and set aside. For ordinary orange or blood orange, use a small sharp knife to cut away the skin, leaving no pith. Slice the oranges into substantial wheels, approximately 5mm thick disc, and then half those. Put the cut slices into a bowl to collect their juices and if your oranges are on the sour side, sprinkle a teaspoon of castor sugar over them. 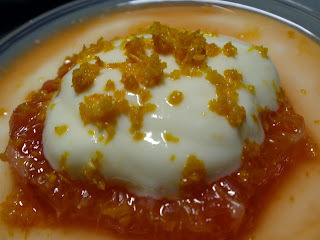 To serve, place a few orange slices over the soft pudding and dollop some reserved yogurt over. Dribble whatever remaining juices you have along with a tiny hill of leftover rind, just for extra colour and flavour. 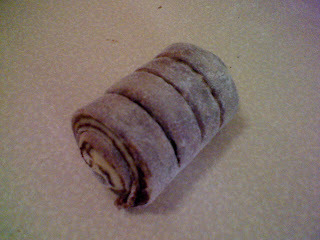 I think this would serve as a good made before hand dessert for a party and even canapes! It's been a week since my last post. New semester starts next week and I have an IELTS exam this Saturday morning. Life is pretty busy and I'm back on track. I'm loving each passing days! I live life to the fullest and do what I like all day long. These chocolate croissants were made last year in Melbourne. It took me one whole day for this batch. I delayed posting it till now because this post has many photos and it took me a while to put things together. I thought we could do with a short break from ice creams and give way to this lovely yummy croissants. For once, less words and more pictures. Below is the Tang Zhong, proportioned and whisked well in a bowl before being cooked till 65°C over the stove. Tang Zhong or water roux starter adds softness to any bread naturally without the need to use preservative. It is a combination of water and high protein flour at a ratio of 1: 5 by weights. Once cooked, I cooled them to room temperature before using. 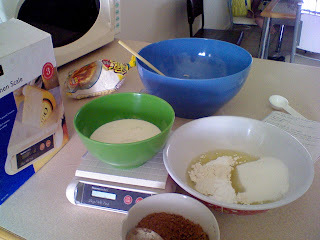 I then do lots of weighing to prepare for the bread dough and also the chocolate filling. 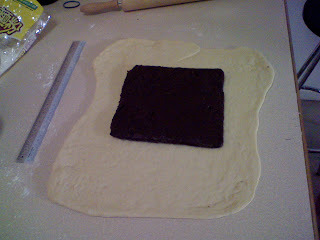 Next, I do the filling which was the chocolate paste and pop that in the fridge to chill until I'm ready to use them. I found the best way to get them in shape is by putting them in a ziploc bag. They don't stick to the plastic surface and came off easily. 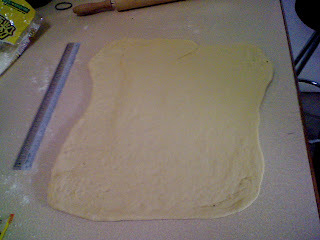 I then roll the bread dough to a big sheet of rectangle. If you've let it proof enough and have kneaded it well until gluten fully developed, you'll have no problem rolling it out. 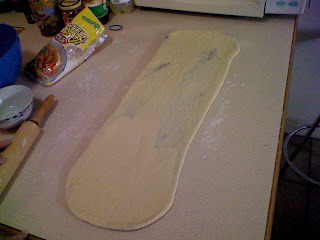 I have emails saying that the bread dough always shrinks back to it's original size. That's because you didn't let it rise enough. 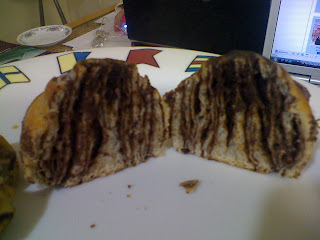 I then place the chocolate filling on top. 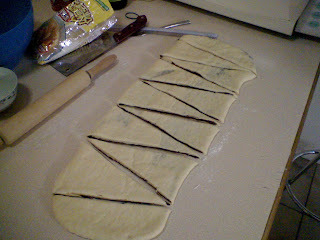 From here, it is best to not make mistakes since the foldings will decide your croissants interior. You want the layerings to be perfect and not cross over each other. 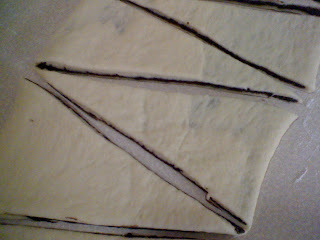 I then fold them into 3 parts like an envelope to completely cover the chocolate filling. I use fingers and pinch to seal the seams very well. I roll it out into a long rectangular sheet again. Make sure you dust your work surface. I fold both ends towards the centre and leave a small gap at the centre where they should meet. 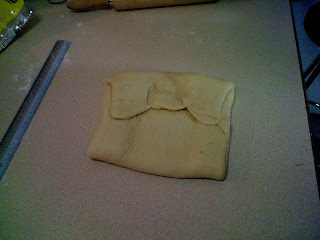 This is so that when I fold it over, it won't be too thick at the centre and start bulging out. 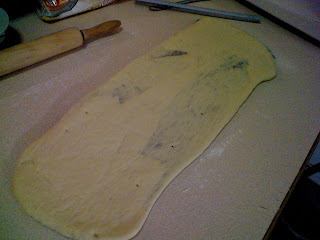 I roll them into a final rectangular gently dust away any excess flour. 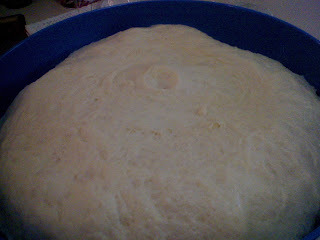 Too much of it will make the bread dough rock hard. I do a little Phytagoras and cut them into equivalent size triangles. I'm an engineer, maths are important. They are very isosceles aren't they? Here comes the fun part, rolling, shaping, egg washing and bake them! I give them a good egg wash coating and bake them straight. I had some leftover dough which aren't triangle. So I make them into rectangles and made a few slits without cutting through. 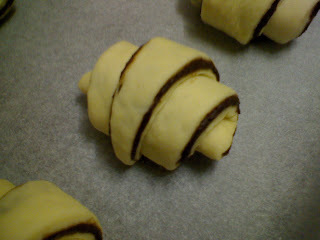 I roll them up, brush away excess flour, egg wash that and bake that too. These are pretty addictive and they disappear rather quickly. I made double the batches and they are all gone within 3 days. 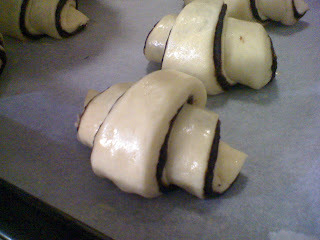 I really heart these little chocolate croissants! Inspired by this Japanese website called Web Site Bread Baking e-pan Studio. 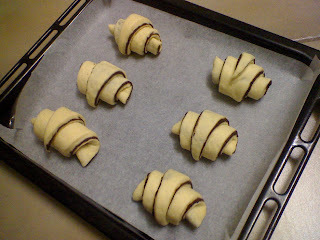 This is the link to these mini chocolate croissants. 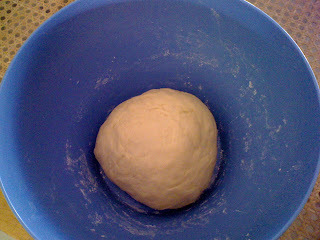 As for the bread dough, I took the recipe from Florence of Do What I like here. It's a little tedious but it's well worth the effect. I hope you will try it. It's 1 AM now and I should be in bed and try revert back to my normal sleeping time before uni starts!